Despite social media's prominence in the public eye (for better or for worse), email marketing still remains an effective, targeted tool for communicating. In our prior blogs, Brainstorming Tips: Creating Content for Social Media, Newsletters and More and Marketing: Social Media Success Tips, we suggest ways to come up with business topics that are helpful to your audience, and how to make the most of your online marketing time. Many of the ideas and techniques used to generate content for social can also be used for email campaigns, and vice versa. 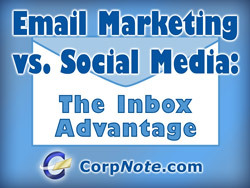 But to get the most benefit from social media and email marketing, we need to understand their differences. In this article we'll discuss some of the basic obstacles you may encounter on your social channels and identify areas where an email or eCard campaign may be a better choice. The immense popularity of social media has created so much data that your message has less of a chance of actually being seen and read. It also might reach your target at times of the day that they may not be in 'business mode'. One of the best attributes of communicating via email – specifically list-driven efforts like newsletters and eCard campaigns – is that you control who sees your message, what they see, and – to a degree – when they see it. To help make this clearer, here's a side-by-side chart that gives several compelling reasons why an email inbox-based communications campaign should remain in your marketing toolbox. People receive a daily 'feed' of all the new social posts they follow. With so much information to choose from, it's less likely that your post will stand out from the crowd. When you send an email, your communications is all they are seeing. It's still up to you to create engaging content, but you don't have to fight through as much clutter. People on social are 'talkers'. They have opinions and they are most often looking for an opportunity to speak – and may not be interested in listening. Good communication does not take place if both people are talking at the same time! People who check their email inbox do so at a time when they are ready to read/listen and are not looking for an audience. Social posts are scanned through quickly, and your message may easily get passed over. When your email newsletter/eCard arrives in someone's email inbox it stays there until the person decides to read it. It can also be more easily found if they want to refer back to it in the future. Even though social posts can be 'liked', 'shared' and commented on, you never have a true idea of which people have seen or read it. CorpNote eCards gives you real-time stats of exactly who has viewed your message, and lets you easily re-send to those who have not. Stay tuned... In our next blog we'll discuss ways to leverage your eCard campaign efforts to work WITH your social media, saving you time and increasing the reach of your message. Do you have a suggestion for a topic you'd like us to cover? Let us know!